To make a masterpiece, along with the skills you require the best quality material especially while doing metal embroidery. So, we have brought to you the best quality French wire or dabka online at wholesale prices only on embroiderymaterial.com. 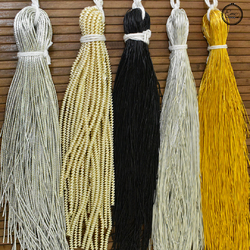 You can buy French wire in beautiful colors and different textures. We are sure you will find the exact material you are looking for here.